Those who have never ground their own beans before might be a little daunted by the prospect of doing this themselves, both from an effort and technical perspective; quite frankly, I’ll admit it seems like a pain in the backside. However, aside from the automatic benefits of grinding your coffee fresh ie. the flavours will be drastically improved across the board compared to pre-ground shop-bought coffee anyway — by grinding your own coffee, you also have a new level of control over exactly how your coffee will taste in the cup. 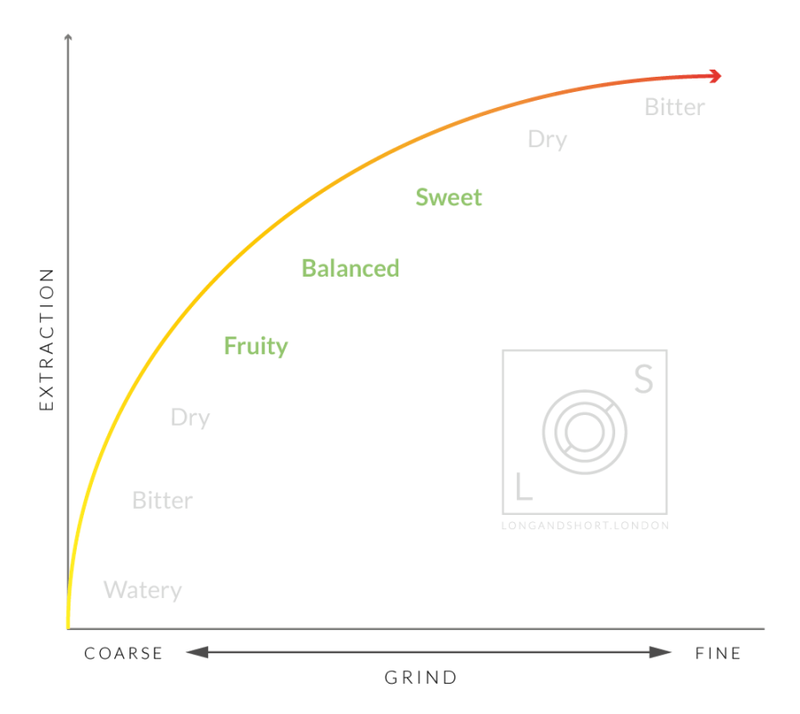 The relationship between the grind and your cup works like this; as you grind finer, more of the coffee particles are finding their way into the cup, and since the particles are finer, they are also brewing at a faster rate. A finer grind = increased extraction. As you can see from this ever-so-scientific graph I just made, the obvious aspect is that we want to find the balance somewhere in the middle of the range. Even if on first attempt you find that the drink is palatable, it’s still advisable to continue adjusting until it either gets dry, or bitter, in order to reign it back and find the absolute ‘sweet’ (or fruity) spot. The basic premise of this experimentation is that when you find the middle, you should be able to adjust slightly finer or coarser in order to adjust the acidity or sweetness level to suit your own tastebuds. Generally speaking, acidity and fruity notices are most prominent in coffees from Africa, and sometimes from Central America and South American microlots — keep an eye on the tasting notes from the coffee you’ve bought, if they’ve been provided. If the coffee is good, you should be able to choose your pick of pushing either acidity or sweetness, or settling on a perfect balance of the two — this is my idea of perfection. Often though, you’ll simply be pushing to produce the most sweetness possible; this is probably the least divisive attribute when it comes to flavour, since many people disagree on what coffee should taste like. Obviously, the range itself can move so even if you find a setting on your grinder that’s perfect right now, this will continue to change depending on the bean, roast level, age of the coffee, brew method – and so on. This is the reason that coffee shops need to ‘dial in’ their grinders first thing every single day. Well, they should be even if they are not. 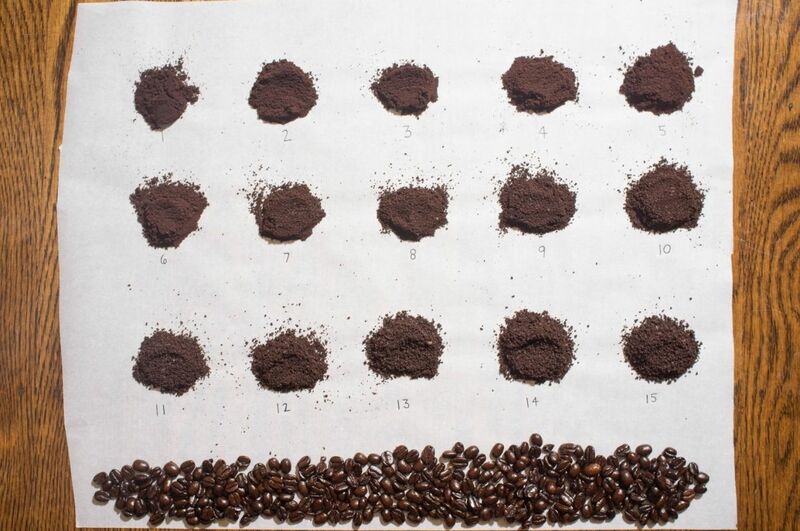 This entry was posted in Education and tagged coffee extraction, coffee grind, featured. Are you buying bad coffee?